Just In time as a philosophy was evolved after World War II in Japan, as a result of their diminishing market share in the auto industry. Taiichi Ohno, father of Toyota Production System (TPS) promoted the idea of JIT. Where, Just In Time led basis for Toyota Production System. However, JIT gained worldwide prominence in the 1970s. The principle behind JIT was to produce only the necessary products at the necessary time and in the necessary quantity. It aimed at eliminating waste of all kinds by producing and supplying only when needed and not earlier. Adopting JIT allowed TPS to do away with inventory in the stores and thereby cutting out the corresponding costs. Henceforth, JIT as a strategy helped companies increase their efficiency level with minimizing the waste. This method requires that producers are able to accurately forecast demand. Production Management: JIT manufacturing focuses on minimization of waste in all forms to achieve value-added manufacturing. They constantly improve their operations and procedures to increase productivity and efficiency. Total quality management: JIT manufacturing is an integrated process to continuously improve quality performance at every level to keep the company competitive and profitable. Human resource management: JIT manufacturing rests on the philosophy that equal respect to be paid for all workers, and the trappings of status are minimized; as it considers human resource as an essential part of the organization. 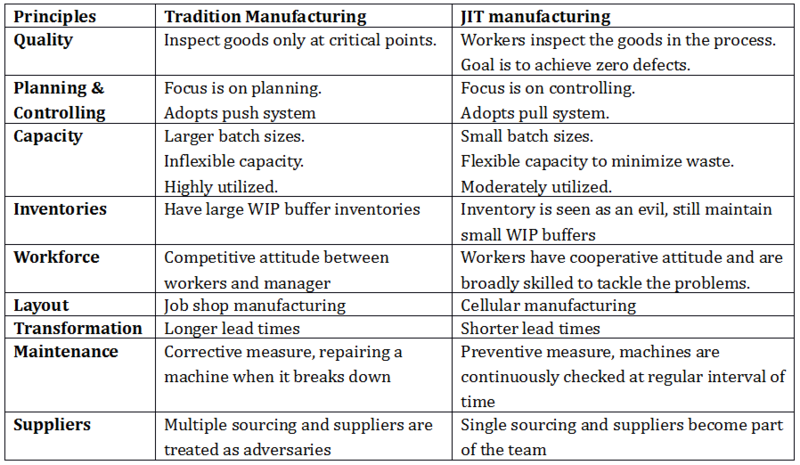 To summarize, JIT manufacturing is a continuous improvement process that throws light on prevention rather than correction, and demands a company to focus on quality of production. The concept of JIT could be applied to any industry, such as food processing industry, shipping industry, oil industry or logistic management; where it is crucial to deliver the right quantity of goods at the right time to the right place.